Can you confirm these amateur observations of Micrurus dissoleucus? dunni: Canal Zone of Panama east into Colombia; Type locality: Ancon, Canal Zone, Panama. nigrirostris: Colombia (lower Magdalena region); Type locality: from Barranquilla, Colombia. Type locality: Maracaibo, Estado Zulia, Venezuela. Diagnosis Diagnosis [dissoleucus]: A small species of coral snake in which the nuchal black ring is not part of the first triad on the body; head crossed posteriorly by a broad light band; no light crossband on snout; tail relatively short; caudals 21-23 in females, 24-28 in males; ventrals 201-212 in females, 175-201 in males; and triads of black rings on the body averaging 9 in both sexes [from SCHMIDT 1955]. 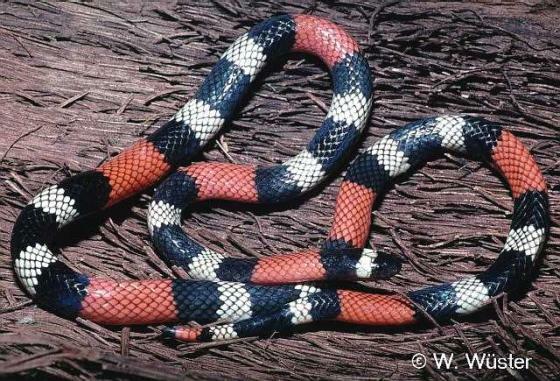 Diagnosis [melanogenys]: A small coral snake with the black ring in triads, the nuchal ring not part of the first triad, and with an extremely short tail; caudals 17-19 in female specimens, 21-22 in male specimens. The number of black rings on the tail is correspondingly reduced, with no more than one complete triad present in the specimens known [from SCHMIDT 1955]. 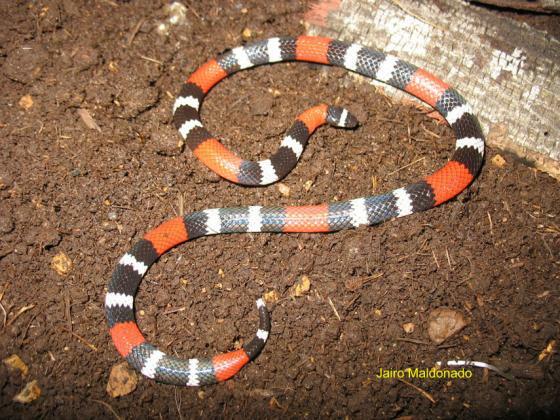 Diagnosis [nigrirostris]: A coral snake of small size, with the black rings in triads, the nuchal ring not a part of the first triad; snout entirely black; ventrals 190-208 in males, 212-228 in females; caudals 23-27 in males, 17-22 in females; number of triads, in both sexes, six to eight [from SCHMIDT 1955]. Diagnosis [dunni]: A small coral snake with the nuchal black ring not a part of the first triad of black rings on the body; caudals in males 23-28; ventrals in female specimens more than 212; and triads of black rings on the body 8-11 [from SCHMIDT 1955]. Synonymy and subspecies partly after PETERS & OREJAS-MIRANDA 1970. Micrurus dissoleucus meridensis ROZE 1989 has been elevated to full species. Barbour,T. 1923. Notes on reptiles and amphibians from Panamá. Occ. Pap. Mus. Zool., Univ. Michigan (129): 1-16. RENJIFO, J. M. & M. LUNDBERG 2003. 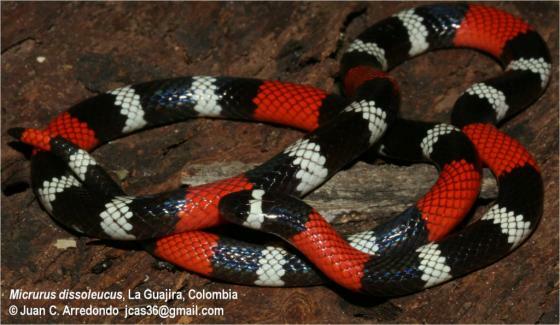 Una especie nuevo de serpiente coral (Elapidae, Micrurus), de la region de Urra, municipio de Tierra Alta, Cordoba, noroccidente de Colombia. Revista de la Academia Colombiana Ciencias Exactas Fisicas y Naturales, 27 (102): 141-144.